The Skinny: An exercise in character perception that uses four actresses to play the same character, The Many Faces of Chika has a structure that is too alienating to be a coherent film. Some good performances and brisk pacing aside, Chika sadly feels like four short art films put together for art's sake. It's typical for biopics to use several actors to portray different stages in the life of a character, such as childhood or old age. Documentary filmmaker Kazuo Hara's directorial debut The Many Faces of Chika takes the idea to the extreme by using four actresses to portray one woman's life within only a short decade. The structure of the film is inherently episodic, showing protagonist Chika's encounters with four different men and how they affect each other's lives. While these men do cross over from episode to episode, The Many Faces of Chika feels more like four short films rather than a coherent whole. Perhaps it should have remained that way. To make each section stand on its own, The Many Faces of Chika doesn't have much exposition. The film opens in 1969 amidst the student riots of Tokyo. Chika (played by Takami Yoshimoto in the first segment) is a talented gymnast who makes a mistake during her performance at the Tokyo Olympics, which causes her to end her own career. 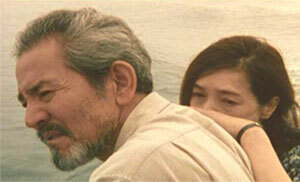 Defeated, she returns to her hometown and marries childhood sweetheart Yoshio (Minoru Tanaka). After several random occurrences, including one with an antisocial student student named Koji, and some devastating news from Yoshio, the film jumps to its second segment three years later. Makiko Watanabe now plays Chika, the gymnastics teacher at a new school, where she is seduced by a fellow teacher. The affair results in Chika's life going into a free fall - a fall not unlike the one she took at the Olympics. In line with the infamous theory of "the male gaze", which argues that all films are supposedly made in the perspective of a male, Hara says the use of the four actresses at different ages is to represent how each man in the respective periods sees Chika. That would explain why Kumija Kim as Chika in the third segment appears much older to the young Koji than Kaori Momoi in the fourth segment, whereas Chika appears younger to an older man (despite Mamoi being older). While this "quick aging" of Haru's heroine is an effective way to show the slow self-destruction of Chika, the constant change of faces can also lead to a general detachment of Chika as a character. Without a clear background for Chika, trying to generate any liking for her is a bit of a task, and her later actions certainly don't help in getting us on her side. What's left is a matter of sympathy; we feel sorry for her because of her bad choices, not because she's a character worth liking. In fact, some can mistake Hara as misogynistic by making a film in which a woman's life is simply dependent on the men around her, as even the film's chapters are named after these men. Of course, that theory would only hold up if the screenwriter and producer wasn't Hara's wife Sachiko Kobayashi. Possible misogyny aside, Chika doesn't seem to be an identifiable character anyway because Hara relies fully on the actresses to bring their own interpretations to the table. However, only Makiko Watanabe delivers a real standout performance as Chika in segment two, showing considerable restraint as a woman in a dilemma. Of course, it might also have something to do with the fact that Watanabe's segment is where Chika's character is the most compelling, as she tries to balance her roles as wife, mother, and lover before plunging to rock bottom. Having only seen Watanabe on Japanese variety shows, I found her short performance here to be nothing short of impressive. However, just when the actress begins to display a broader range in her performance, the film changes its main actor yet again. Notes:  While Kumija Kim, who played Chika in the third segment, passed away in 2004. The film was not released until 2005 because it took several years to shoot. This was officially her final performance.